“You can tell a lot about fighters by their walkout song. Especially in the Reebok era, where self-expression on fight night is pretty limited, the song that fighters choose to play on their way to the Octagon reveals much about who they are as both competitors and individuals. Max Holloway is among the few fighters who have found the single best song to represent who they are and how they fight. Moke Boy’s “Hawaiian Kickboxer” is Hawaiian country music, and Holloway’s hometown of Waianae, Oahu, is most definitely Hawaiian countryside. In fact, singer Moses Kamealoha III — Moke Boy himself — is from Waianae and wrote the song when he got kicked out of Waianae High School. “There are basically two lenses through which I enjoy mixed martial arts. Truthfully, there are a myriad of reasons why I love this sport, general and specific, but nearly all of them fall under one of two overarching categories. First is the strange, bizarre storylines that materialize in this sport. Unlike the mainstream stick-and-ball sports, MMA still exists somewhat on the fringes of society, which leads to fascinating and hilarious things happening that are broadly endemic to the fight game. Think Anderson Silva’s blue vial defense hearing, Nate Diaz’ post-fight vaping or roughly 80 percent of all heavyweight fights. MMA boasts a brand of ridiculous that is idiosyncratically MMA, and it’s easy to love. On the opposite end of the spectrum, there are the superhuman performances, the in-cage violence that somehow feels edifying and virtuous. These things exist in their own ways in every sport, but in combat sports there is something all the more visceral and compelling and, dare I say, even heroic about them. The Ultimate Fighting Championship is founded on this type of performance; the legendary yet true tale of a scrawny Brazilian guy mysteriously making men twice his size quit by doing funky things with his limbs and theirs is hard to replicate elsewhere in the world of professional athletics. “The middleweight title picture in the Ultimate Fighting Championship is about to get weird. 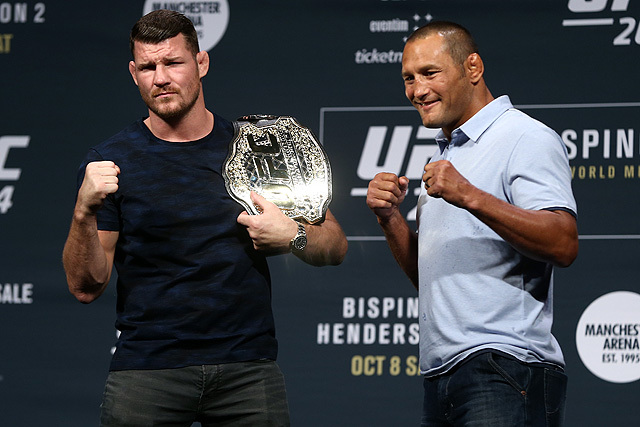 Newly minted middleweight champion Michael Bisping at UFC 204 on Saturday in Manchester, England, will defend his belt for the first time in his home country against Dan Henderson, who knocked him senseless seven years ago at UFC 100. 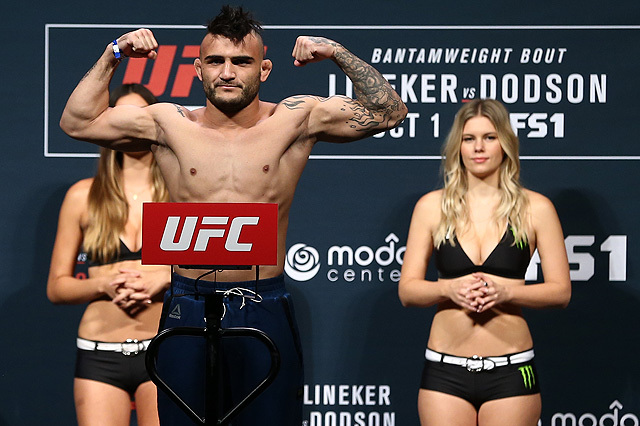 “The Count” was long considered past the point of being a serious title contender, but “The Ultimate Fighter 3” winner has since experienced a late-career resurgence that culminated in a first-round knockout of Luke Rockhold at UFC 199 in June. This will be the first time Bisping fights three times in a year since 2010. It will also be his 27th fight in the UFC, which will tie him with Frank Mir and Tito Ortiz for the most all-time. 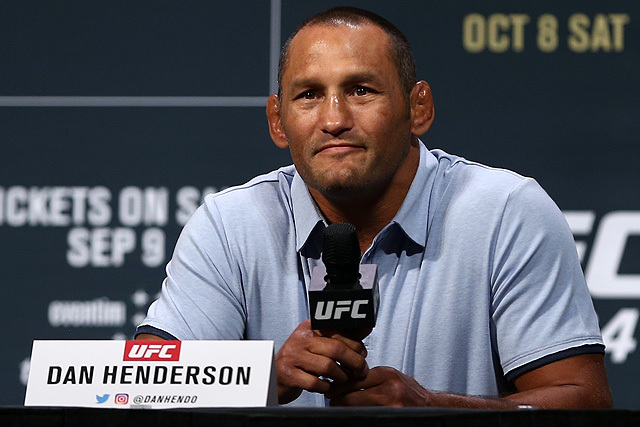 It is not often that a single-fight winning streak earns a crack at the title, but that is exactly where Henderson finds himself. The 46-year-old is a legend of the sport, though he has not won back-to-back fights since 2011. The former two-division Pride Fighting Championships titleholder is 2-2 since dropping back to middleweight in 2015. His last fight was a second-round knockout of Hector Lombard, which happened the same night that Bisping claimed the title. Prior to that, “Hendo” was 2-6 over the course of four years and hardly in the title hunt. This will be his second fight of the year and quite possibly the final fight of his storied, decades-long career.